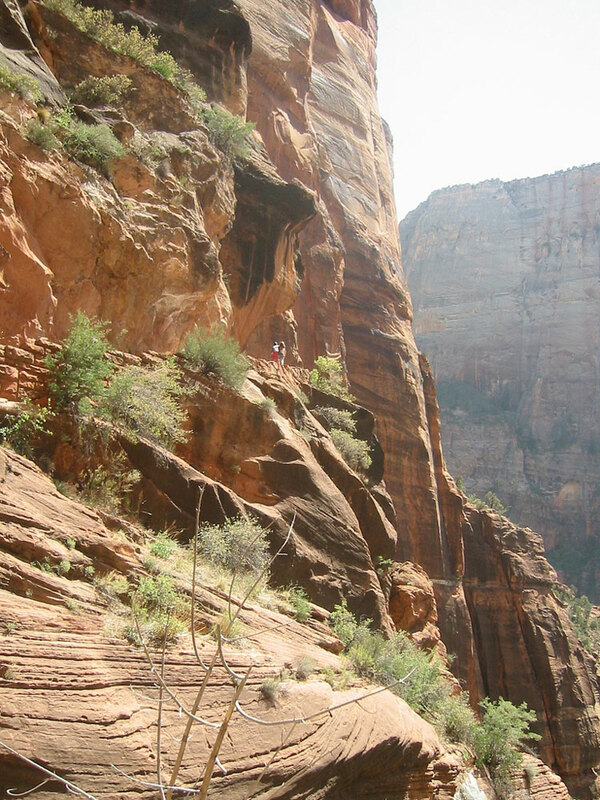 Outstanding 1,500 ft climb up a high and absurdly narrow spine at the heart of Zion NP. 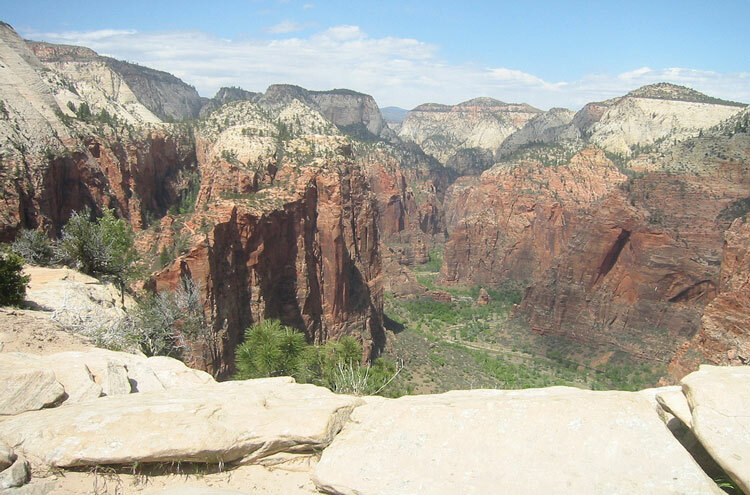 Marvel at superb and gripping all-round views of the deep, deep Zion canyon. 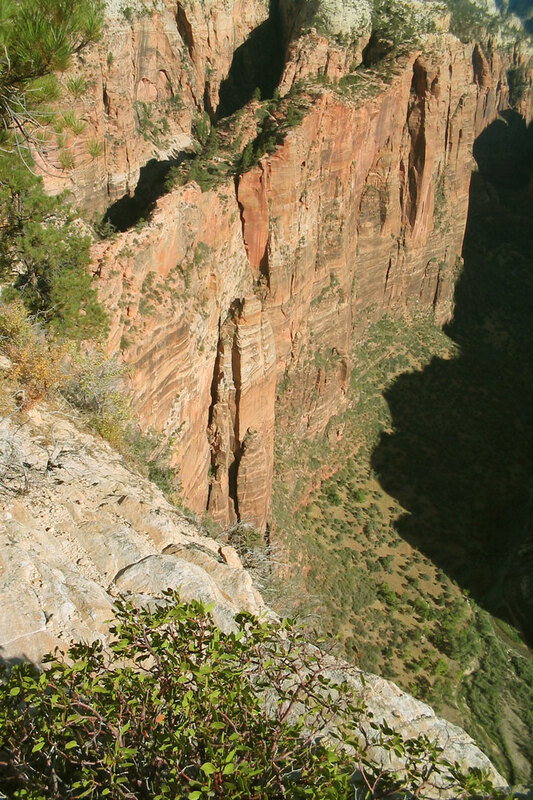 From Scout Lookout it is a thrilling clamber up the spine on a steep narrow and often horribly exposed path. 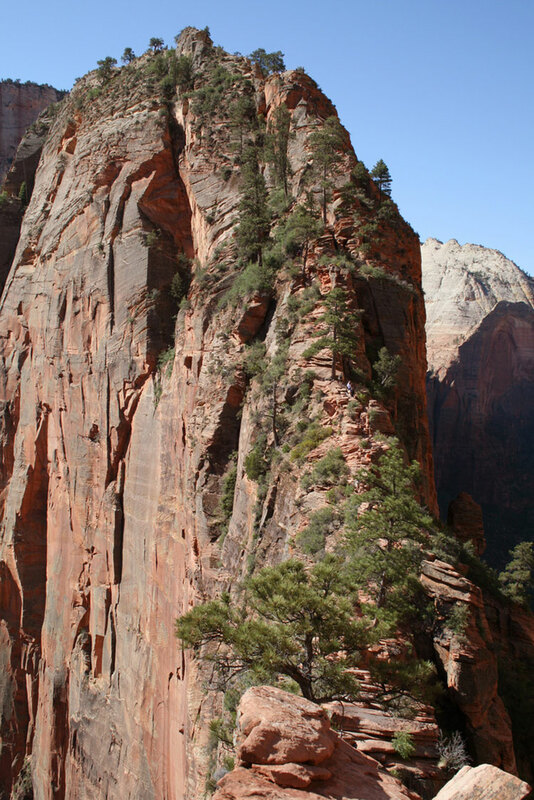 This outstanding 1,500 ft climb to the top of a high and absurdly narrow spine (“only an angel could land on it”) at the heart of the spectacular Zion NP is justly famous. 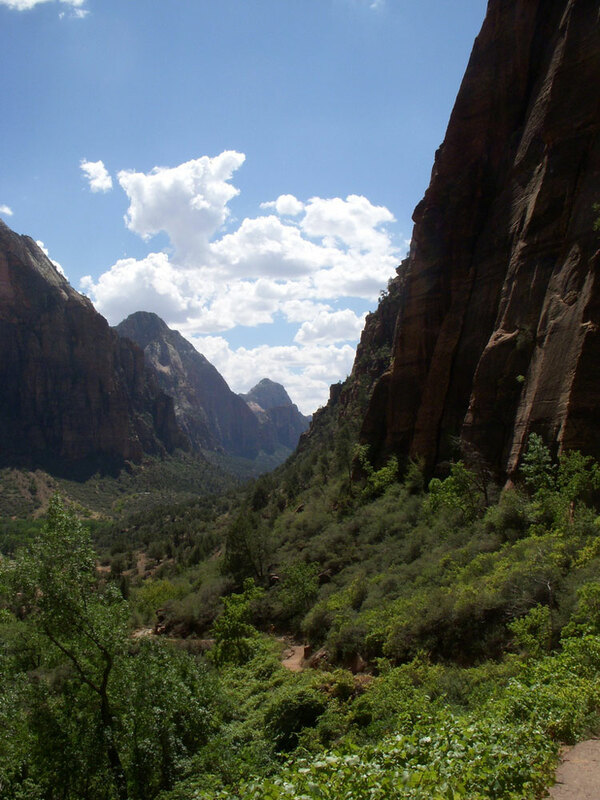 Marvel at superb and gripping all-round views of the deep, deep Zion canyon and its spires, towers and red sandstone walls. 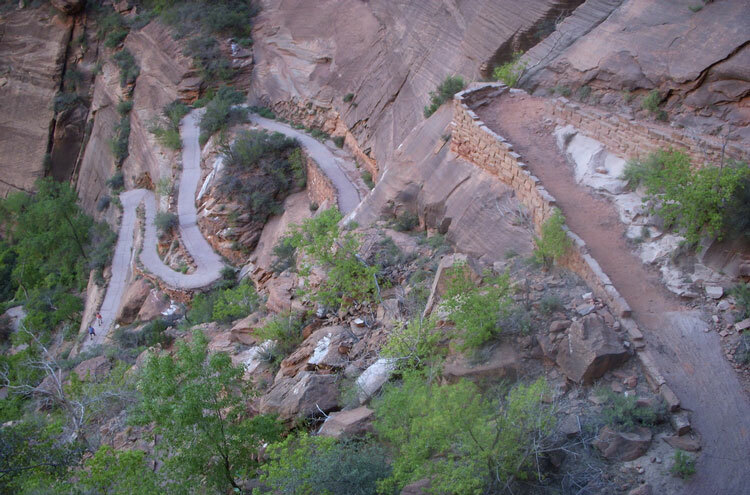 The climb to Scout Lookout, the turn-off to the Angel’s Landing spine, is steep but straightforward. Thereafter it is a thrilling clamber up the spine on a steep and narrow path, often teetering, horribly exposed, over huge drops, with many cable-assisted stretches: don’t try this bit if you are uncomfortable with heights – but the climb to Scout Point is well worthwhile in its own right. The trail up from the canyon floor at the Grotto is superbly constructed. 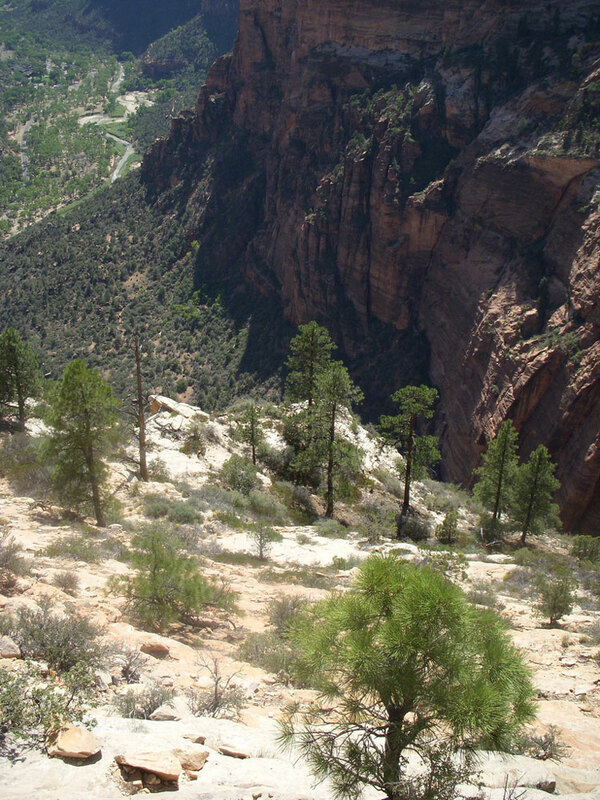 You cross the rushing Virgin River, and follow a path beside it for a while, then start to climb steadily up the western side of the canyon to the base of a brilliantly engineered series of switchbacks which finds its way up an impossible-looking cliff, following faults and winding up steeply embanked stretches. A few minutes’ walk along the bottom of the dark, narrow and vast-cliffed Refrigerator Canyon, so-called because it is always cool as always sunless, gets you to the base of Walter’s Wiggles, a series of 20 or so tightly-wound switchbacks up an absurdly steep cleft tucked into a corner of the cliff-face. This will be a boring slog, although the surrounds are so exciting, the time will pass. 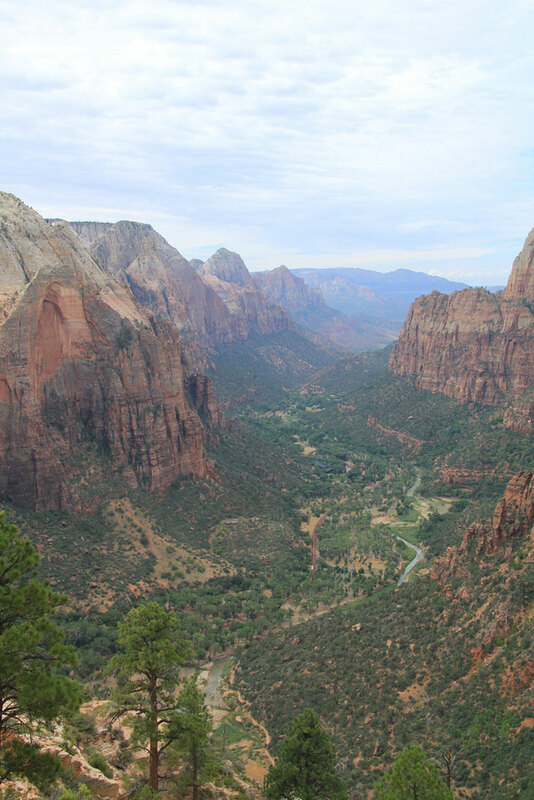 Enjoy the enormous new views at Scout Lookout, which you should reach in an hour or more, depending on your fitness, then take a deep breath and start the giddy clamber up the spine the Angel’s Landing. You are almost immediately clinging to cables, shuffling above already-uncomfortable drops. You reach a minor summit, then drop a little to the base of the impossible-looking spine, which the trail starts attacking head on, then concedes defeat and struggles its way up the right hand side. 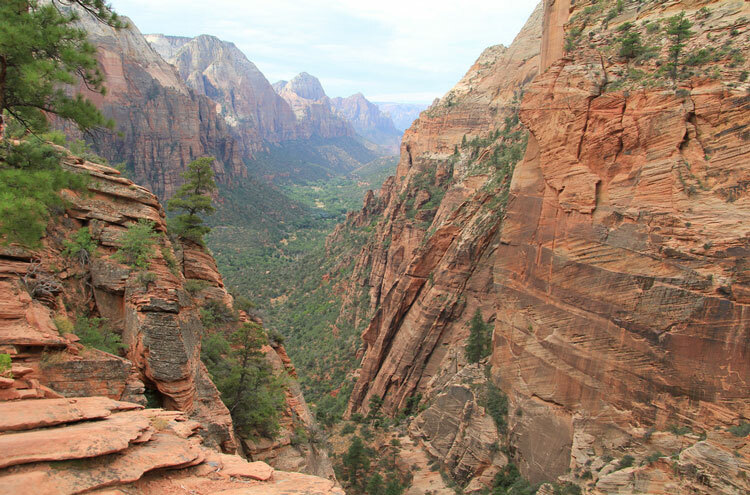 After a breathtaking climb, you get to a flat, narrow (a few metres) and gut-wrenchingly exposed wrist of rock; not long after, you are at the Angel’s Landing platform. The views are – literally – incredible; lets hope you find they justify the fear of the climb. 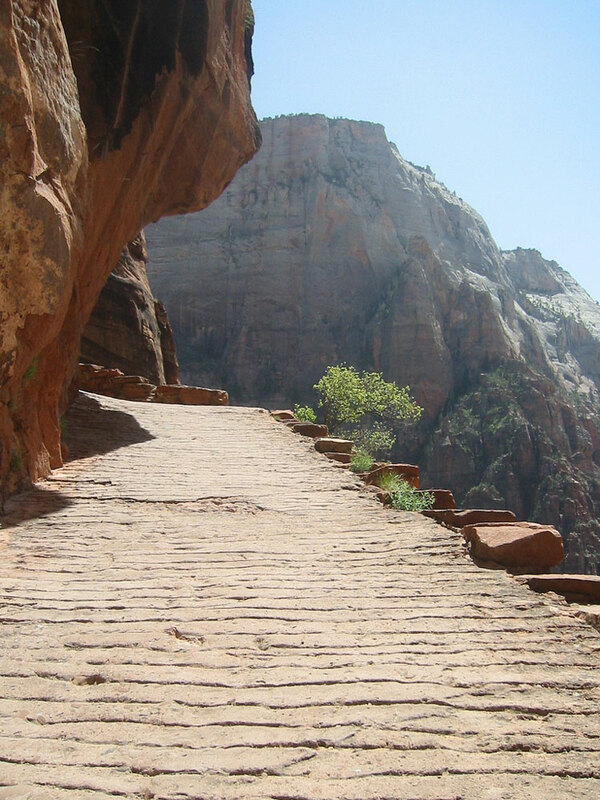 Zion is heavily visited, and this is one of its great trails, so you won’t be alone here. 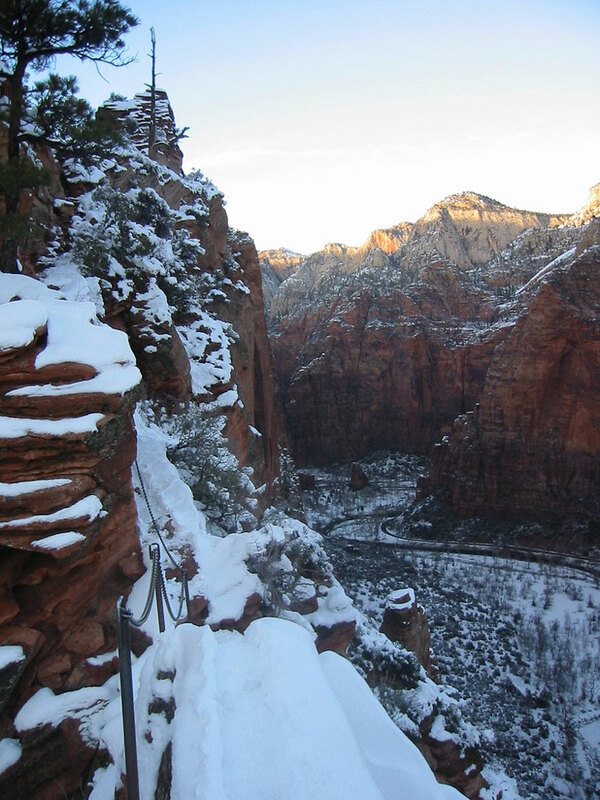 The trail is concreted and crowded to Scout Lookout, a but depressing to the purist; it is still far too busy on the Angel’s Landing spine, which is inconvenient with so many awkward one-way stretches where no mistake can be made. This is demanding walking. Beware heat/lack of water; extreme exposure in places and lightning risks. Come fully prepared, including carrying enough water. 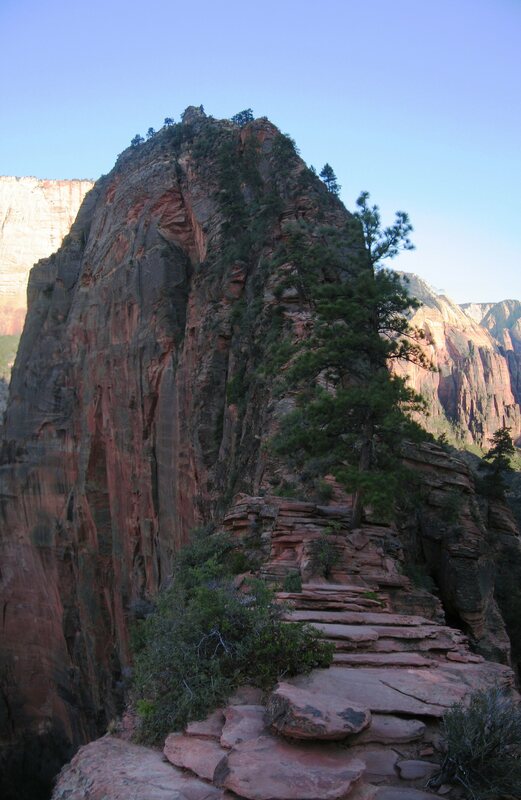 The Grand Canyon with Zion and Bryce Canyon NPs – Cicerone: excellent, includes all relevant practical information. Recommended. Find relevant books on Amazon. 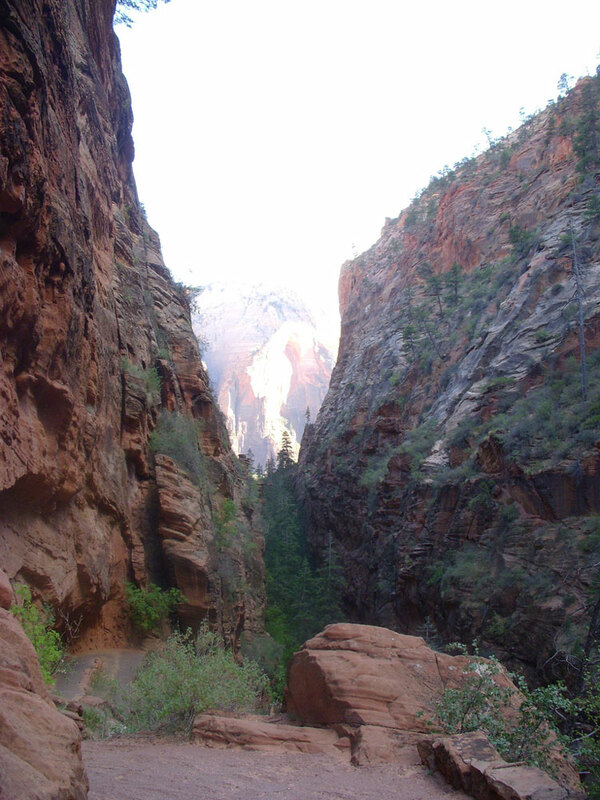 See our Zion National Park page for more general and important practical information, warnings and photos.